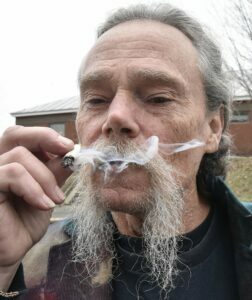 SKOWHEGAN — Close to three decades since the first one was held, marijuana advocate Donny Christen’s annual Patriot’s Day “smoke-in” at “high noon” on the courthouse steps in Skowhegan ain’t what it used to be. 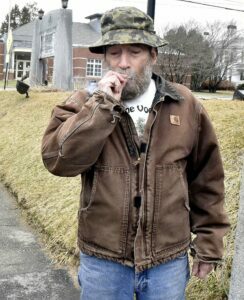 His health failing from the effects of chronic obstructive pulmonary disease, Christen on Monday greeted just three people to join him in the rally to fully legalize all uses of marijuana in Maine. Christen’s annual rally at the courthouse is in its 29th year, having first been organized in 1991. By not establishing recreational marijuana rules in Maine, the sale of marijuana — other than medical marijuana — would remain illegal despite a state referendum passed in 2016, legalizing adult use of marijuana. 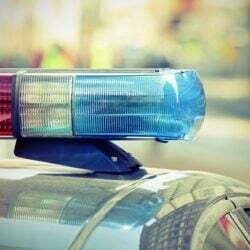 Cities and towns are within their rights to ban or regulate recreational marijuana sales, but marijuana use technically is legal. Advocates like Christen say that while state law does allow municipalities to ban recreational marijuana sales within their borders, doing so doesn’t mean there won’t still be people buying and selling marijuana; they’ll just be doing it illegally. Under Maine law, municipalities may not ban medical marijuana caregivers from providing marijuana to authorized medical marijuana patients. 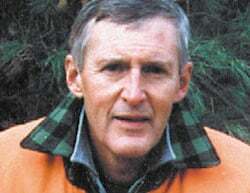 Municipalities may, however, regulate how and where such businesses operate. In March, the state pulled out of a deal with a Florida company to set up a seed-to-sale tracking system for retail medical and recreational marijuana – the second failed state marijuana contract in as many months. The state Department of Administrative and Financial Services pulled out of its three-year deal with Franwell Inc. to use a customized tracking system after state lawyers warned the award could lead to costly and time-consuming litigation. The agency says the withdrawal will not delay the timeline of the long-awaited passage of Maine’s adult-use cannabis program, which voters adopted by referendum in 2016. Going on three years later, home grow is allowed, but legal sales are not. A consultant was expected to submit a first draft of proposed adult-use marijuana rules to the state Office of Marijuana Policy last week, putting Maine back on track to open its recreational market by the end of this year, state officials said. To launch in 2019, the Office of Marijuana Policy must shop its draft rules around to other state agencies, including agriculture, labor and public safety, for review and revision before referral to lawmakers in May for a legislative vote that must be held before the session ends in June. Joey Annaloro, 48, of Skowhegan, said he showed up Monday to support Christen and his advocacy. Robert Hardenburg, 59, who lives in Solon, showed up at the rally passing out homemade snickerdoodle cookies made with pot butter. He said he’s been coming since 2004. Christen acknowledged Monday that rally participant numbers are dwindling. A fourth man showed up later for the “high noon” assembly, and a couple more people sat and watched from parked trucks, but that was it.